Facebook has announced its first branded hardware, launching camera-equipped displays to challenge the Amazon Echo Show. But their offer to place a camera inside homes follows hot on the heels of a major data breach that affected tens of millions of Facebook users. First popularised by the Amazon Echo Show, smart displays are essentially smart speakers (like the Echo or Google Home) with integrated screens capable of providing visuals in addition to audio responses. 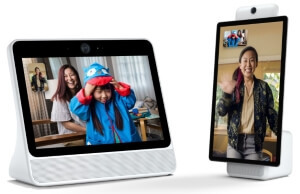 The Facebook Portal and its bigger sibling the Portal+ can play Facebook Video content, though Facebook is focusing heavily on the video calling aspect that lets you chat to other Portal owners, or anyone on Facebook Messenger. Voice recognition is powered by the familiar Amazon Alexa. The smaller Portal is equipped with a 10-inch 720p display and two speakers. The larger Portal+ has a 15.6-inch 1080p screen and more powerful audio output with tweeters and sub-woofer. The Portal+ is fairly imposing for a smart gadget (think laptop screen mounted on a stand) while the 10-inch model is a more conventional size that seems better suited to general use in homes. Both use a 12MP camera sensor and can automatically track a person within their field of view so you don’t have to sit still while making a video call. In terms of specs the Portal is, on paper, a serious challenger for the Echo and forthcoming Google Home Hub. It certainly seems like if video calling is something you would like to do then the Portal is a very easy way to enjoy high quality video chatting. The biggest hurdle it faces is persuading people that it can be trusted with a camera in their homes. Smart home devices are already viewed with well-deserved suspicion, and Facebook doesn’t have the best reputation for privacy. The recent Facebook data breach is its biggest ever, exposing around 50 million accounts. By exploiting the “View As” feature hackers discovered a way to gain full access to Facebook accounts - including linked third party applications. After announcing the leak, Facebook forced 90 million users to log out of their accounts and disabled “View As”. But Facebook has gone out of its way to reassure Portal owners. It claims it has focused on privacy from the ground up, and both Portal devices have a physical cut-off for the microphone and camera which cannot be controlled remotely. But that doesn’t change the fact that the Portal will be sending data to Facebook servers when it’s in use, and persuading the world that it’s safe to allow a Zuckerberg brand all-seeing-eye into homes could be an uphill battle.